Victoria and her friends are really excited. They are going to the 2018 Vintage and Steam Show at the wonderful Weald and Downland Living Museum, Singleton, West Sussex. It’s a great show and you get full access to the huge museum site, nestled under the South Downs. 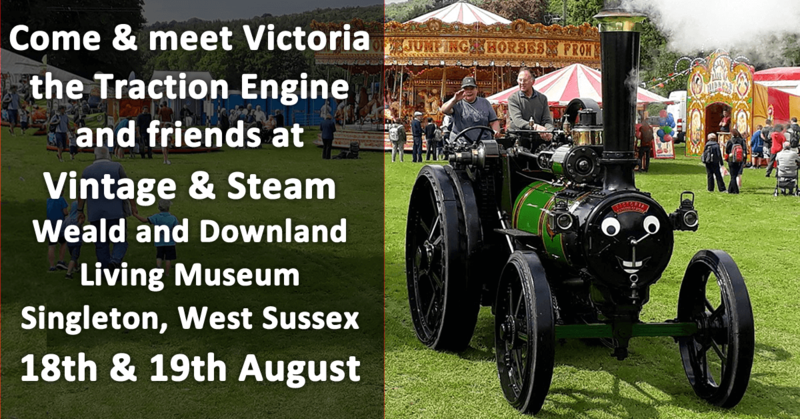 Come along and meet Victoria and her friends, Finnigan the Tractor, Lady Pride of England, Wildfire and other engines too. A wide range of vehicles will be exhibited including: commercial and military vehicles, miniature steam engines, a narrow gauge railway display, model boats on the mill pond, Gauge One Group display in the Downland Gridshell building, a range of classic and vintage cars, and a large display of classic and vintage motorcycles.